I also can’t forget to mention my adult students. Finishing my last lesson at Papita, I held back a few tears. It was incredible to compare my first and last conversations with them, because of how much they had improved. I will always look back on those warm afternoons thinking only of happiness. The last thing I wanted to mention was the incredible tolerance I found in the civil center. I’d prepared myself for lots of prejudice against gypsies, or “colored” people (I found it interesting that the same term was used as in America for two very different groups of people who face undue discrimination), and instead found myself teaching gypsy foster children in an incredibly caring and supportive environment. I know this kind of thinking is not representative of Hungary as a whole, but it was a wonderful thing to see where some progress is being made, and how the relationship between economic and social class that has for so long proved impossible to separate is slowly, but surely, being unbound. 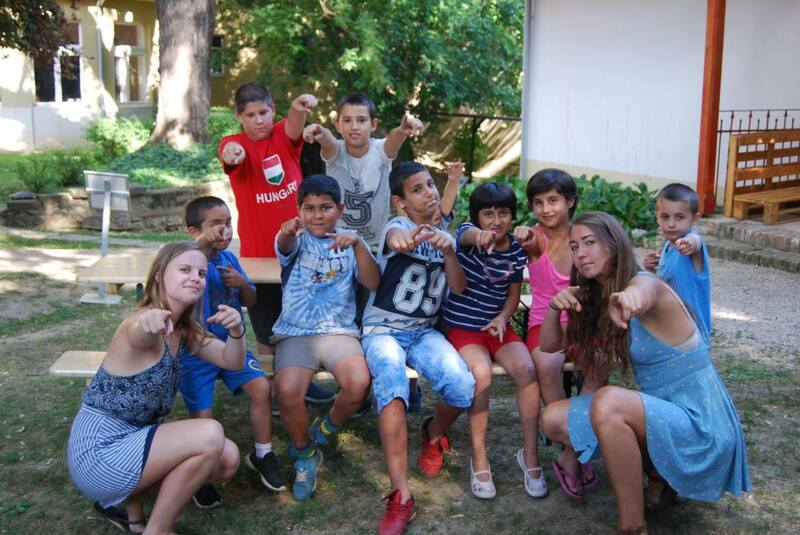 Volunteering has ironically not been the theme of my three weeks in Hungary– it was instead the incredible generosity of the Hungarian people I met, and all that they showed me. Reflecting on my experiences in Hungary can be put very simply. It exceeded any and all expectations, and I feel both incredibly privileged and incredibly proud to have been able to see all that I saw and do all that I did. Saying “Szia” to Hungary is a very bittersweet thing. Bubu and Gyorgy seem to have a very simple life. Every morning, they eat bread and homemade apricot marmalade. Sometimes they drink coffee, other days tea. They go to work– Gyorgy takes the car to various construction projects, and Bubu takes the bus into the city. At 5, they return to the house, throw off their shoes, and relax. Laundry is hung to dry in the warm Hungarian breeze, cherries are picked from the garden, dinner is cooked, the lights are turned off. Their cat sleeps on the porch. A typical family. But like the cover of your favorite book, the surface only relays a fraction of the stories beneath. Dinner is full of teasing. The most commonly heard words from Bubu’s mouth were, “Gyorgy…. very stupid.” I don’t think there was a dinner where we weren’t brought to tears laughing at something. Just last night, it happened to be about google’s translation of “suitcases” in english, to “kindergarten teacher” in hungarian. Of course, we ate zero vegetables, lots of cheese, and finished with some cookies and wine. Some nights, we would go to the lake (Orfu) to swim and relax before dinner. The drive was half the reason to go– a small, winding road that twisted through green forests and golden fields, the sun setting over the lake. Other nights, neighbors would come over for dinner, or we would all go grab drinks in the city. But night time was the only time for relaxing. Every day, Bubu has something planned. She frequently went to villages to learn more about their local culture, and help with ‘programs’ that were planned there. The true definition of a grass-roots organizer, this woman has the most energy of anyone I have ever met. We often listened to her talk for half an hour without skipping a beat. I think that without the language barrier, we might have been able to listen to Bubu for the rest of our lives. And we would enjoy every minute of it. These are all signs of a person whose ultimate motivator is a deep fascination with the fullest experience of life itself. Bubu and Gyorgy showed me a life that is a balancing act between optimism and realism which they perform so effortlessly. I will never be able to express how grateful I feel for their generosity in welcoming us into their home with such easygoing happiness. I know we will stay in touch, and I hope they know that if Bubu and Gyorgy ever want to come to California, they have a place to stay (though I can’t promise food of the same delicious quality as was provided to me). I have only good, great, and greater things to say about them, and the memories I have made in Hungary are some I will carry with me for the rest of my life. This week, I was fortunate enough to be given a short tour of the Zsolnay Cultural Quarter of the town by a woman who has lived her whole life here. Judit certainly talks a lot. We must have had over 50 “very nice old buildings” pointed out to us. But the Zsolnay quarter was the birthplace of the most quintessential Pécsi material– Eozin. The Zsolnay family built the factory that produced the coveted blue, green, or even purple and pink material that has become a symbol of Pécs. I asked Judit about her experiences growing up near the working factory. She reminisced about touring the bustling factory as a child, with a big smile on her face. It turns out she was a classmate of Matyasovsky Zsolnay Zsofia, the granddaughter of the man who ran the factory, Miklos Zsolnay. Judit mentioned that during her lifetime, she saw the factory taken under control by the state. I naturally asked Judit how different life was under socialism, but her answers were milder and less definite than the ways I had been taught to think of life behind the Iron Curtain. Judit was an interpreter for the Russian officials when they visited Pécs, and she often led them around the factory. In Judit’s grandmother’s garden, there were lots of pieces made in this factory. Interestingly enough, in Hungary, socialism did not hit city families too harshly. While farmers were pressed by increased quotas and business owners were targeted, factory worker wages remained as high as before in Pécs, even as people worked with less productivity, according to Judit. She called this “gulash socialism” because most people still had plenty to eat. However, she did mention to me that when the factory was nationalized in the late forties, the Zsolnays were taken in to custody to be questioned, as they were part of the bourgeois class that was targeted in the regime change. Zsofia, her classmate, went to an orphanage. But Judit mentioned that the workers in the factory had loved the Zsolnays, because they had treated their workers fairly and paid them a good wage. The proof in this was that the workers helped smuggle food into the cell where Zsofia’s parents were kept. After the fall of the iron curtain, when the factory was privatized again, Judit explained that due to lots of arguments over ownership rights, the factory was never restored to its former glory. Today, only one small part of one of the buildings is used to make small ceramics, and it was obvious that Judit thought it shameful, compared with what it used to be. This is just one of a few stories I have been told that I wanted to record, both for myself, and for especially my host-mother, who cares so much about the preservation and spread of Hungary’s different local cultures. The inevitably disappearing ripples in the water let fascination play on my face. It never ceases to hypnotize; it never ceases. The shadows grow and shrink over my bronzing skin, approaching just to recede once more. Water resists limb and I resist reality. Shame, anxiety, vanity are carried away with each ripple and every shadow, until nothing but the ever-changing mirror that surrounds me remains. Words mean nothing here– here, we only understand the sounds of laughter and the heat of a relentless Hungarian sun. I shed myself. I search for and cannot find the words to mean being here and nowhere else. For the first time in a long while, I am nothing and need nobody. It leaves an indescribable trace, a blank stare on my face and a heart that beats to feel just once more the blissful and ignorant peace of the lake. 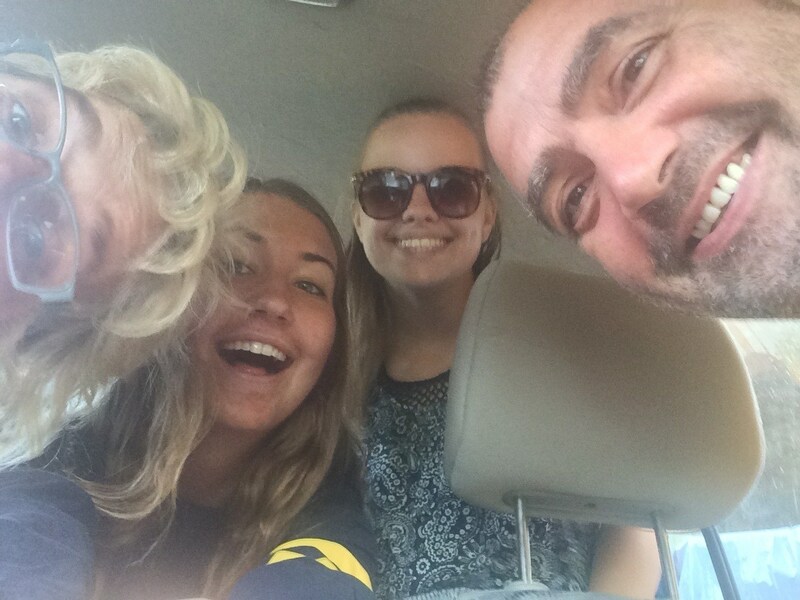 On the second Monday of our stay in Pecs, Bubu arranged to travel with some volunteers to a few villages quite close to the Hungary/Croatia border. After about an hour-long journey in the morning rain, we arrived in Tesenfa at a small house with a large yard with some tables, covered by white tents, with an eclectic group of volunteers sitting beneath them. Volunteers from all different parts of the region (mostly Slovakia, Romania, Croatia, Serbia, and Hungary) were taking part in a kind of volunteer exchange. 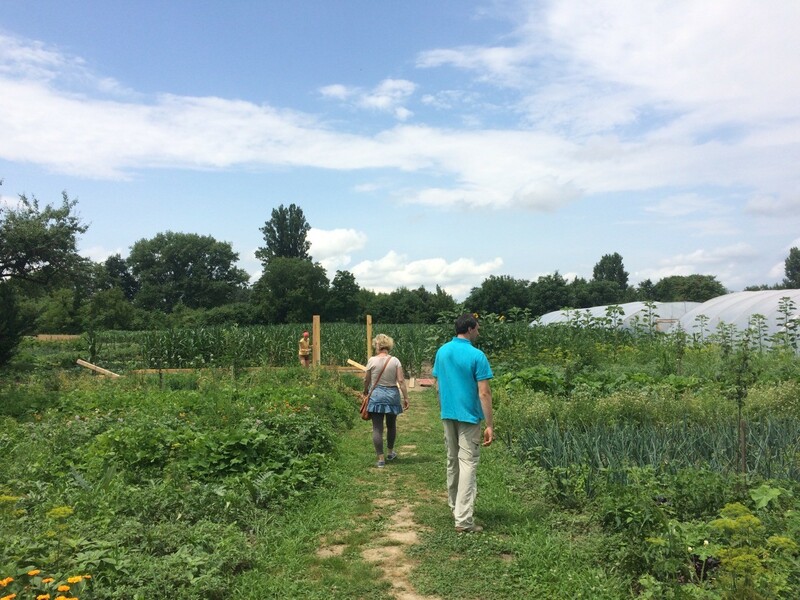 As I understood it, the volunteers got food and accommodation while they helped traditional Hungarian families on different projects and operations. Some were helping to build a greenhouse on a small farming plot. Others were learning how to make clay ‘ornaments’ in the traditional village style. Others still were cleaning shingles for fixing a roof. Our group simply watched this taking place. Most of the homes were small. Few had cars– bikes seemed to be the preferred method of transport. Water ran cold from the spickets; dogs and cats roamed from house to house. Small children played soccer in the shade. Broken, rusty objects were strewn about in many grassy yards. We ended our tour with the village’s reformist church. A short, wrinkled, smiling woman walked up to us; her round glasses showed the pride in her eyes as she spoke about the church. It was built in the mid-1800′s. Decades ago, the church was a center of the village, with over 160 regularly attending. Today, she said it was lucky to see 5 or 6. She continued to explain how the younger people of the villages never stay around, anymore– they leap at the first chance to escape to the bigger cities like Pecs or Budapest, or even leave Hungary behind entirely. Emigration from both rural Hungary and Hungary in general seemed to be troubling for many of the volunteers. It was deemed the ‘million dollar question’: in the face of urbanization– which draws younger generations towards it like flies to honey– how does a village retain both its culture and its youth? Can it have both? At lunchtime, we returned to the volunteer meeting place. Food was served in no shortage– lentils, cold vegetable salad, and plenty of fresh bread. Laughter only briefly interrupted the constant sound of conversation I have come to expect from Hungarians. We finished eating, washed our dishes, and said our goodbyes as the volunteers returned to their posts, the sun, as always, beating down on everything below. These small villages are truly rich centers for the past. A rural lifestyle may be a bit more dusty than one in the city, but all in all, I didn’t see poverty in the same way it is known in the United States. 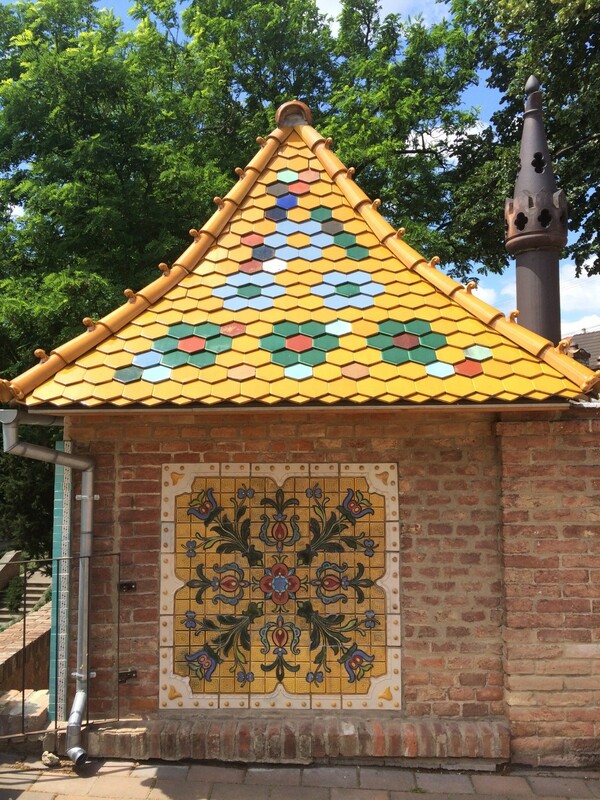 The inhabitants are proud of their products, whether it be textiles with well-known Hungarian sayings on them or ceramics with their village’s coat of arms. The biggest question is whether this can be a lifestyle that younger generations will see the value of, instead of just a cultural sight for tourists like me to pass through.